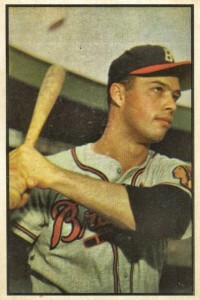 In the debate of greatest third baseman ever, Eddie Mathews is certainly in the discussion. His legendary power combined with his impressive defensive skills made him one of the most popular players of the 1950s. His baseball cards are some of the most valuable from that era as well and this top list combines those important early releases with cards from this entire career. Shop for Professionally Graded Eddie Mathews Cards on eBay. 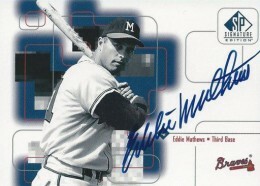 Over Mathew's 15 seasons with the Braves, Mathews made the case to be the ultimate fan favorite for the team as he is the only player to have played for the team in Boston, Milwaukee, and Atlanta. He helped the team win the 1957 World Series title and he was a nine-time All-Star over his career. At the time of his retirement, his 512 total home runs placed him in sixth all-time, virtually guaranteeing his spot in Cooperstown. Eddie Mathew's career with the Braves will always rightfully be tied with teammate Hank Aaron. Over 12 seasons together, they hit 863 home runs combined, placing them at the top of home run-hitting duos. 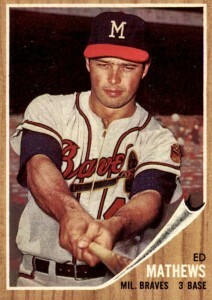 Mathews was even the manager of the Braves when Aaron hit home run 715 to pass Babe Ruth in 1974. Another notable distinction for Mathews was that he was featured on cover of the first issue of Sports Illustrated. The image features Mathews at bat in a game against the Giants and you can find a card in the 1998 Fleer Sports Illustrated set that honors that cover photo. Collectors looking for less-known cards of Mathews can check 1967 Topps for his one appearance as member of the Houston Astros and 1968 Topps for his only card as a Detroit Tiger. 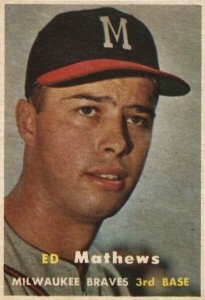 His 1968 Topps card would also prove to be his last card as a player. In addition to his player cards, Topps also issued two cards detailing Mathew's time as a manager and you can track those down in 1973 and 1974 Topps. A rare Mathews card that has incredible value is his appearance in the 1964 Topps Stand-Ups set. This foldable 70-card set was produced for one year and Mathews card is one of the 22 cards that were short-printed. It is an extremely rare card to find in mint condition and was not included in the top list because of its scarcity. In an effort to construct a well-balanced and comprehensive collection of the key Eddie Mathews baseball card appearances, the value of his key cards was weighed against their accessibility to collectors to determine the best of the best. Although it advertises a product that baseball card makers wouldn't dare support today, the Red Man Tobacco cards from the mid-1950s offer amazing painted alternatives to the Bowman and Topps sets. Collectors with a limited budget can pick up a version of this card without the bottom tab attached for a steep discount over cards with it still included. 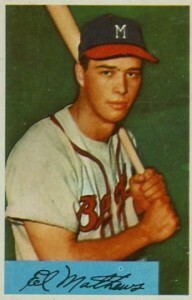 The famous 1955 Bowman TV set was Bowman's last and the Eddie Mathews card was included in the second series in the set. The first series has become famous for having a lighter wood color around the television set while later series have darker wood color, similar to a cherry wood. 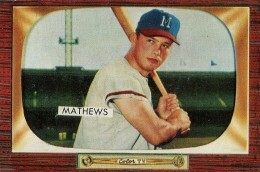 Mathews appears in the final three Bowman sets from 1953 to 1955 but missed out on the 1952 set while still being included in 1952 Topps. Along with this base card appearance in the 1962 Topps set, collectors can also find a Topps blank-backed stamp featuring Mathews that was inserted into 1962 packs. This smaller set features 200 stamps in total. 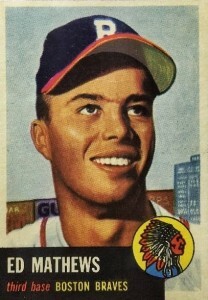 Mathew's 1957 Topps card offers a nice closeup of him wearing his Braves cap. Ed was a key contributor in the Braves win over the Yankees in the 1957 World Series and he struck World Series gold again by helping the Detroit Tigers win the 1968 World Series in his final season. 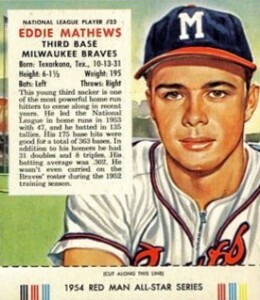 On the back of his 1954 Bowman card, Eddie Mathews is compared to a legendary Yankees' slugger as "a junior Babe Ruth." The comparison seems apt as he led the National League in home runs that year and would hit more than 30 home runs each season for nine consecutive years. 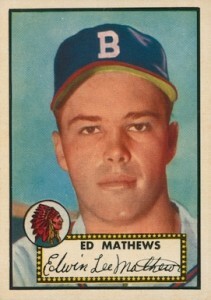 Mathews made his full-color photograph card debut in 1953 Bowman Color and on the reverse side, for the first time, Bowman include the previous season's stats. Mathews' 1952 performance was impressive with 25 home runs and 58 RBIs, but he finished third in the Rookie of the Year voting behind Joe Black and Hoyt Wilhelm. Collectors looking for a certified Mathew's autograph don't have too many options as he passed away in 2001 before the dramatic increase in autographed cards occurred. One of his first signature cards can be found in 1999 Upper Deck SP Signature Edition. Braves collectors can also turn to 1999 Upper Deck Century Legends which features an autograph with a photograph from his days as manager of Atlanta from the early 1970s. 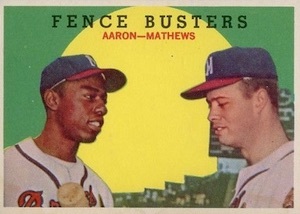 You can find a few great Topps cards featuring Mathews and Hank Aaron together and my personal favorite is the "Fence Busters" combo in 1959 Topps. In 1958 Topps, collectors can get four Braves for the price of one as Mathews and Aaron are joined by Joe Adcock and Del Crandall on a card highlighting the Braves impressive home run lineup. Having your debut baseball card as one of the key inclusions in a set as legendary as 1952 Topps (see #1 on this list) would typically mean all of your other cards would pale in comparison. Yet Mathew's 1953 Topps card is one of the key valuable cards of that set and is his last Boston Braves card before the team moved to Milwaukee. Although Mickey Mantle's 1952 Topps card dominates the top of the price list, Mathew's Boston Braves rookie card is a close second for most valuable in the set. The card benefits from not only being the first card for a legendary member of the Hall of Fame, but Mathew's card is also among the high-numbered short-prints in the most popular Topps set ever. 2003 TOPPS GALLERY HOF REFRACTOR #45 EDDIE MATHEWS PSA 10 GEM-MT POP 1 FINEST! I have 1964 tops standup card of Ed matters in great shape.the rare on that I was reading about.for sale.